Ranking seventh in the list of the Maha- puranas 1 the Markandeya Purana, is one of the most important, interesting and probably one of the oldest works. 2 Its recitation frees one from the taints of sin. It was named after the sage Markandeya, who acquired its knowledge from Brahma, the creator of the universe. Once Jaimini, the author of the Mimansa Sutra, approached him with a request to instruct him on four questions. The holy sage Markandeya directed him to the four celetial Birds that were well-versed in the sastras, for answering his questions concerning a religious enigma, a social perplexity, a moral incongruity, and a violation of natural justice. Summing up the general character of this Purana which hardly applies to the Devi Mahatmya Prof. H. H. Wilson says, "This Purana has a character different from that of all the others. It is nothing of a sectarial spirit, little of a religious tone: rarely inserting prayers and invocations to any deity, and such as are inserted are brief and moderate. It deals little in precepts, ceremonial or moral. Its leading feature is narrative; and it . presents an uninterrupted succession of legends, most of which when ancient are embellished with new circumstances, and when partake so far of the spirit of the old, that- they are disinterested creations of the imagination having no particular motive, being designed to recommend no special doctrine or observance. Whether they are derived from any other source or whether they are original inventions, it is not possible to ascertain. They are most probably for the greater part at least original; and the whole has been narrated in the compiler's own manner; a manner superior to that of the puranas in general with exception of the Bhagavata. The Markandeya Purana has come down to us in three editions, published at Bombay, Poona and Calcutta. 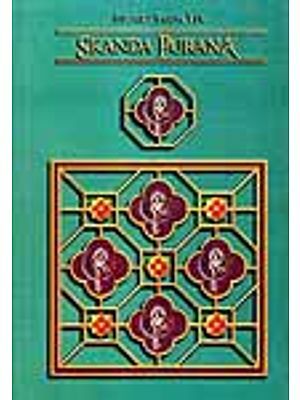 It is difficult to answer which edition comes closest to the archetype of Markandeya. The Calcutta edition ends abruptly in chapter 136, leaving 'Dama' acquiescing tamely in the fight of his father's murderer, Vapusmat. The other version is found in the Bombay and the Poona editions and carries the story on till Dama takes venge- ance on Vapusmat. Dr. K. M. Banerjee considered that the abruptness and incomplete- ness were strong evidences of the genuinneness of the concluding of the Calcutta edition. But Prof. F. E. Pargiter considered the concluding of the other editions as more authentic. The Markandeya Purana consists of nine thousand verses, spread over one hundred and thirtyseven chapters. An English translation of the Markandeya Purana was done by Prof. F.E. Pargiter, which appeared in the Bibliotheca Indica Series, Calcutta from 1880 to 1905. Some chapters on life after death were also translated into German. There are three definite stages in the development of the Markandeya Purana . First stage is represented by the chapters from 43-81 and 93-136. 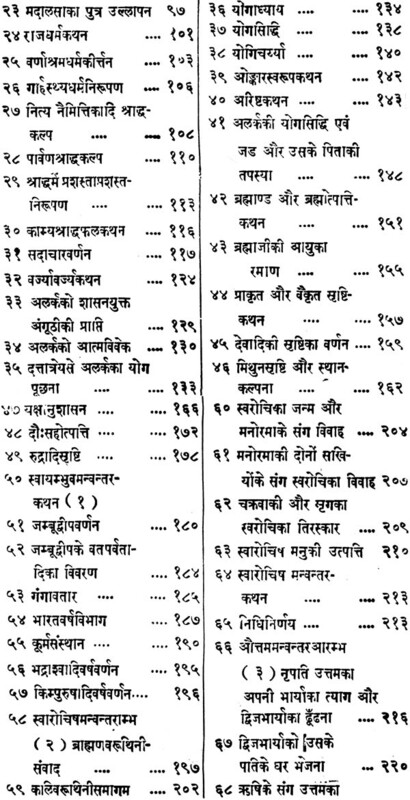 These chapters constituted the Purana in its original shape as the Markandeya Purana. The name would imply that originally Markandeya was the chief figure. It is only in this portion that he appeared as the real teacher. 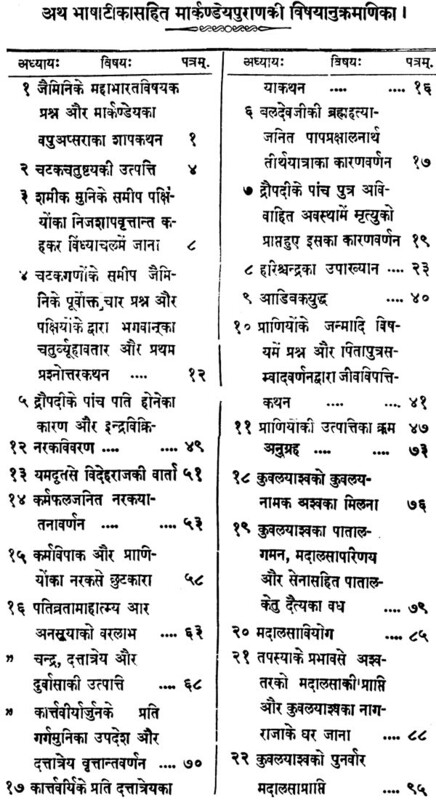 Here Markandeya declared that he heard it when Daksa related it. He further informed the sages that the Markandeya Purana was equal to the Vedas and had likewise sprang from the mouth of Brahma, These words clearly betray the true beginning of the Purana. In the second stage chapters from 1-42 were composed. They were then prefixed to the original Purana, related by the sage Markandeya. In these chapter; Jaimini is referred by Markandeya to the wise Birds and they ex- plained to him the four questions that perpIexed him and some relevant matters. That this part is undoubtedly - a later addition, is . proved by the fact that no higher authority than the sage Markandeya and the unknown brahmin Sumati is claimed for this part. Though Birds were raised to the primary position in this part yet the pre-eminence of the sage Markandeya was maintained by introducing him at the very beginning to declare the wisdom of the Birds and by giving the impression that the Birds were merely repeating the teachings of Markandeya. The Birds on beginning the Purana retire from further notice', but reappear with Jaimini in the final chapter to conclude their discourse and give consistency to combined instruction. This was a termination rendered necessary by the prefixing of this part to the original Purana. In the third stage, a long episodical and independent narrative of the actions of the goddess Durga (chs. 81-93) was inserted in the Markandeya Purana. The subject thereof and the character attributed to the goddess show that it is the product of a later age which developed the sanguinary feature of popular religion. The Devi Mahatmya is a clear inter-polation in which real speaker is a rsi named Medha, The praise of goddess Mahamaya. in chapter 81 is in ordinary style. Her special glorification begins in chapter 82 and is elaborated with the most miraculous imagination. Some of the verses breathe deep religious feeling, express enthusiastic adoration and manifest fervent spiritual meditation. On the other hand, the descriptions of the battles abound in wild and repulsive incidents and revel in gross and amazing fencies. The Devi Mahatmya is a composition of the most opposite characters. The religious outpourings are at times pure and elevated, the material descriptions are absurd. The 137th chapter concludes the work, it is a neccessary corollary to the first part. The Purana in both of its sections appears to have emanated from western India. Both these sections indicate the middle portion of the Narbada and Tapti valley as their place of origin. The Devi Mahatmya must have originated in some place dedicated to the goddess in her terrible form. The poem has now be- cornea text of the worshippers of Kali through- out Northern India, and in Bengal. The goddess whom the poem glorifies is a goddess formed by -the combination of the powers of all the gods, and she is called Mahamaya Candika, Ambika, Bhadrakali and Mahakali. She is generally identified in the hymns with Siva's consort as Durga, Gauri, Sivaduti and Mahakali. The -goddess Kali is also called Camunda, Candika from whose forehead she sprang, named Her Camunda because she had killed two great demons canda and Munda. Both Siva and his consort in their most terrible forms were worshipped at Mandhata. The Narbada Valley was specially Connected with demon legends. Mandhata with such associations would in all Probability be the birth place of this poem and the brief allusions to Mahakala would than be only a collateral one. Even it the poem was composed at Ujjain, The Conclusion would still hold good that it originated in Western India. The question of the date of the Markandeya Purana has been a controversial one. Since a copy of the latest part of the Markandya Purana, i. e., the Devi Mahatmya, dated 998 A. D., was found by Mahamahopadhayaya Harprasad Shastri in the Royal Library, Nepal, therefore, the Devi- Mahatmya cannot be later than 9th century. It may even be considerably earlier. As it is the latest part of the Purana, the other parts must have been composed earlier. Prof. wilson holds that this Purana is. later, Than the mahabharata but anterior to the Brahma, Padma , Naradiya and Bhagavata Puranas. He conuctures that it my be placed in the 9th century A. D. but the jaina writings reveal that the puranas are much earlier than that what Prof. Wilson estimates the padma Purana of the jainas, written bby Ravisena dated 678 A.D. mentions in the Adipurana of Jinasena who lived about a century later. 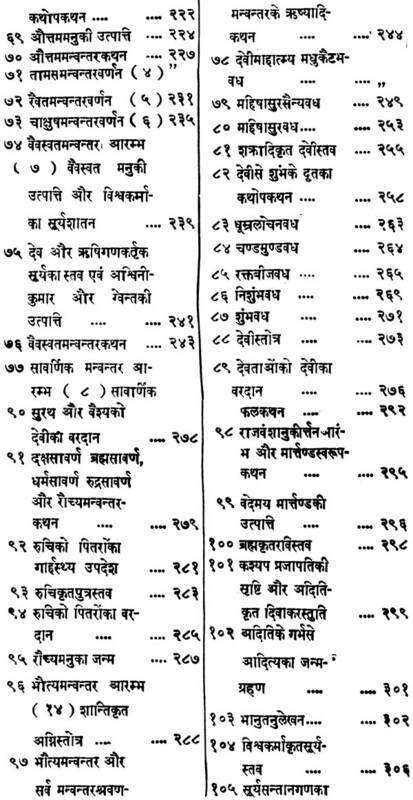 This evidence would demonstrate that all the Puranas have been composed before the end of the sixth, and probably by the end of the 5th century A. D. Hence the Devi Mahatmya was certainly complete by 9th century A.D. and very probably in the 5th or 6th century A. D. The second part which constituted the original Purana was probably in existence in the third century and even earlier; and the first part was composed between those two periods. The traditional definition of a Purana generally includes five topics viz., sarga (cosmogony). 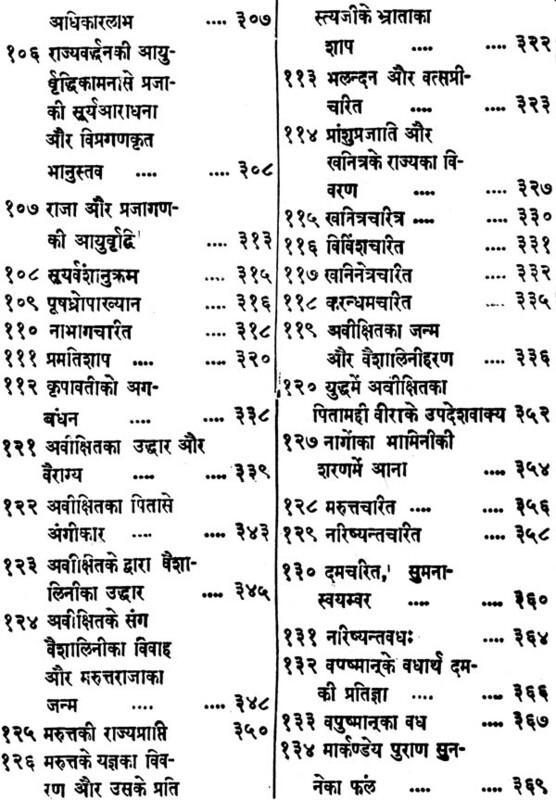 pratisarga (secondary creation or destruction), vamsa (genealogy of gods and kings), manvantras (the reigns of the Manus). vamsanucaritam (history of the solar and lunar lineages) - A careful study of the Markandeya Purana would reveal that it closely conforms to the pancalaksana definition of the Purana, The description of cosmology is given from 47 to 55 chapters. The process of dissolution is detailed in the 46th chapter of the Purana, A detailed account of the genealogies form the subject matter of chapters 101.111-136. Manus and their manvantras are discussed in chapters 46, 53, 61-80, and 84-100. The history of the 'solar race is attempted in the chapters from 102-110.12 Besides these topics, the Markandeya Purana deals with geography, and religious devotion (yoga), philosophical ideas, political and social conditions, education, ethical 'standards and natural justice. The Markandeya Purana begins with the 'Story of the four Birds that were acquainted with the moral notions of right and wrong. 'Everything is narrated fully by the sage Markandeya through these Birds when approached by Jaimini for instructions on four questions. The Birds were sons of Drona and the "Apsaras Vapu who were cursed by rsi Durvasa to be Birds and narrated the story of their birth and their education by Samika: and explained ,that they were four brahmins who were so born, because cursed by their father Sukrsa for not offering their bodies as food to a hungry Bird. The celestial Birds are represented as answering the following questions: "How was Visnu born as a mortal? How Draupadi became the wife of the five Pandavas? Why did Baladeva undertake penance for brahmanicide ? And why were the children of Draupadi destroyed when they had Krsna and Arujna to defend them?" The Birds answered thus: Visnu took on a mortal body in order to accomplish good, Draupadi became the joint wife of the five- Pandavas because they were all emanations of Indra; Baladeva committed brahmanicide during intoxication and expiated it by pilgrimage, and five Visva Devas, who on seeing Viswamitra's brutality towards king Hariscandra, censured Viswamitra, incurred his curse there by and were born as the five sons of Draupadt, to die young and unmarried. This story led the Birds at Jaimini's ,request to narrate the whole story of Hariscandra" sufferings and ultimate beatitude. and the terrible fight which resulted there from between Vasistha and Viswamitra as gigantic Birds. In the chapters from 10 - 15 Jaimini's questions regarding conception, foetal life, birth, growth, death and the consequences of actions are answered by the Birds by reproducing instructions that a Brahmin Sumati, nicknamed Jada, once gave to his father. The subject of yoga or religious devotion is illustrated by the stories of Maandavya. Datattreya and Alarka in the chapters from 10-19. Description about the birth and education of Alarka is given in the chapters from 20-26 Then followed an expression of political, religious and 'social doctrines in the guise of instruction given by Madalasa in chapters 27-35. An exposition of religious devotion (Yoga) again takes place in chapters from 36- 44. An account of creation is attempted in the chepters from 46-52. Enquiry about creation is answered dy Birds by repeating what Markandeya had taught Kraustuki. In 53rd chapter Markandeya discoursed of Manus and Manvantras. From chapters 54-60, the Purana gives a geographical description viz. earth and its continents especially Jambudvipa, Mount Meru, Ganga. Then follows an account of the nine divisions of Bharata, It also deals with mountain ranges and its scattered hills; and rivers distinguishing them according to their sources, in the Himalayas. Various peoples inhabiting India and its surroundings according. as they dwelt in the middle land, in the northwest, outside north-wards in the north west. in the east in the south. in the west, around the Vindhya Mountains and beneath the Himalayas. are described here. India is also described as resting upon Visnu in the form of a tortoise. The sage also comments on some astrological, religious and political matters. From chapters 61-80 follows the account of Manus and Manvantras. The Devi Mahatmya is narrated from 81- 83. Various forms of Devi are eulogised in these chapters. Chapter 101 deals with the genealogies. The majesty of the Sun is glorified in chapters from 102- 110. Description of the genealogies is again resumed in the chapters from 111-136. The Birds closed their long repetition of Markandeya's instructions to Kraustuki with an encomium on the Puranas and this Purana in particular. Thereupon Jaimini expressed to the Birds his deep sense of gratitude. I. Wilson CH.H. 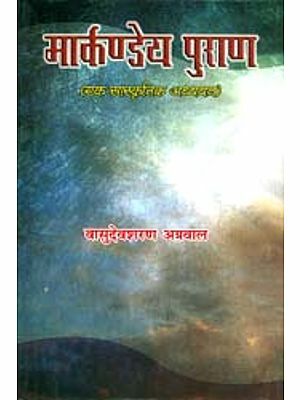 ), Visnu Purana, 3.6.20.24.- Nag Publishers, Delhi. Bhagavata Purana. 12.3.3-8. 4. Pargiter (F. E.), The Markandeya Purana, Introduction. p. VII. 6. Ibid. pp. 550-51, Pargiter (FE.). op. cit p. IV. Here Pargiter divides the purana into five distinct parts. 7. Pargiter (P. E.), op. cit., Introduction, pp. IV-V.
12. Shukla (B. N.) Mirkandeya Purana: Eta Adhyayana Banaras. 1961. pp. 8-43.